The VIA AMOS-5002 modular industrial system is an ultra compact solution designed to take full advantage of the VIA EITX-3002 board, making it easy to create a broad spectrum of easy to assemble, fanless system designs for a wide variety of embedded applications. The VIA AMOS-5002 industrial system comes in two configurations: standard (AMOS-5002-L) and expanded (AMOS-5002-H). The standard (AMOS-5002-L) configuration is the slim rugged system measuring 250.2 mm (W) x 41 mm (H) x 123.5 mm (D).The expanded (AMOS-5002-H) configuration is the rugged system with storage section that can support one 2.5" disk drive and two additional rear accesses for COM connectors. It measures 250.2 mm (W) x 58 mm (H) x 123.5 mm (D) and can withstand a wide temperature range of -20°c to 45°. 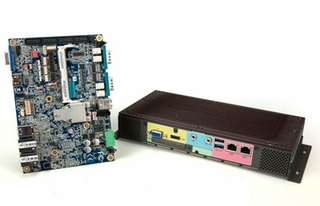 Both AMOS-5002 configurations are capable of handling a wide range of DC power input (7V ~ 36V), and has leverages the unique features that the Em-ITX form factor brings to the embedded market, including a rich I/O feature set along both sides of the board through unique dual I/O coastlines, and the EMIO bus, which uses both legacy and modern bus technologies to work with a growing range of Em-ITX expansion modules in a variety of application specific I/O configurations. Systems built using the VIA AMOS-5002 industrial system are completely fanless and can withstand a wide range temperature due to the creative de-thermal design utilizing blade style thermal fins. The VIA AMOS-5002 system design is capable of sustaining a g-force of up to 20 and 50 for AMOS-5002-H and AMOS-5002-L respectively, and easily assembled and maintained, using only four mechanical pieces to form a robust, fanless system with extensive I/O options.